So I got a new kitten. Wheeeeey *insert stereotypically girly screeching sounds* Whilst he is dead cute and I love him, there was a sensible thought process behind introducing another pet to the apartment and it wasn't only my cat-broodiness getting in the way of actual life (for once!). Inspector Bucket has been an only cat since I bought him home from the RSPCA shelter almost a year ago, and it was fine (I told myself) when we had Ruby, our old labrador retriever, and a cat flap. Now however, Bucket is a (very happy) indoor cat, and has only human company, which I felt was inappropriate given that he is (don't tell him) a cat. I felt that another cat would mean that Bucket had someone his own shape to play with, and to keep him company when I'm not about, but as he's now grown in to a fully matured adult cat, I was worried that getting another would create a weird territorial dynamic, so adopting a kitten seemed the more compassionate option. It's worked out for the best. Bucket has well and truly put The Kitten in his place, as I thought he probably would, but The Kitten has enough gumption to give some back, and certainly won't roll over and let himself be bullied (especially not if there's food involved!) The two of them have taken a little while to work out who's who and what's what, but now they play happily and wash one another, and things appear to be settling down. They share food bowls and a litter box now so - I guess they're friends. 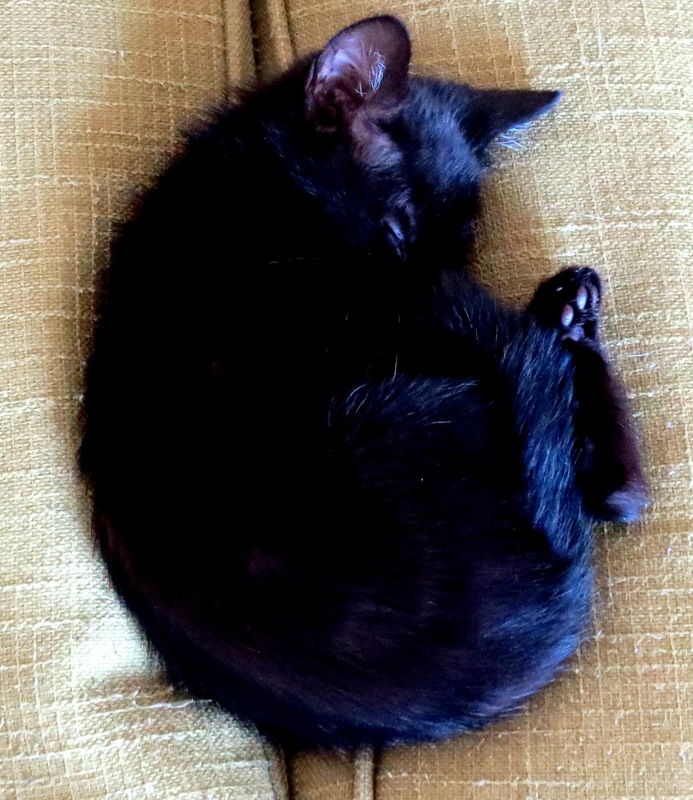 Anyway - more about The Kitten. His name was originally Burger - it made me chuckle and he's such a fat little pudding of a cat that it definitely seemed to suit him. Seb instantly latched on to the name and has stuck with Burger ever since, but I started to have wobbles and doubts after a few hours and Boyfriend complained that it "wasn't an actual name". Eventually we agreed on Bruce (as in Wayne) as The Kitten is black - but I very quickly started referring to him as Batman. So eventually - he had 2.5 names, with Seb still very much referring to him as Burger, Boyfriend coming over and calling him Bruce, and me nonchalantly referring to him as The Kitten (although I still sort of think of him as Burger The Cat). At this rate The Kitten is going to end up being his name. 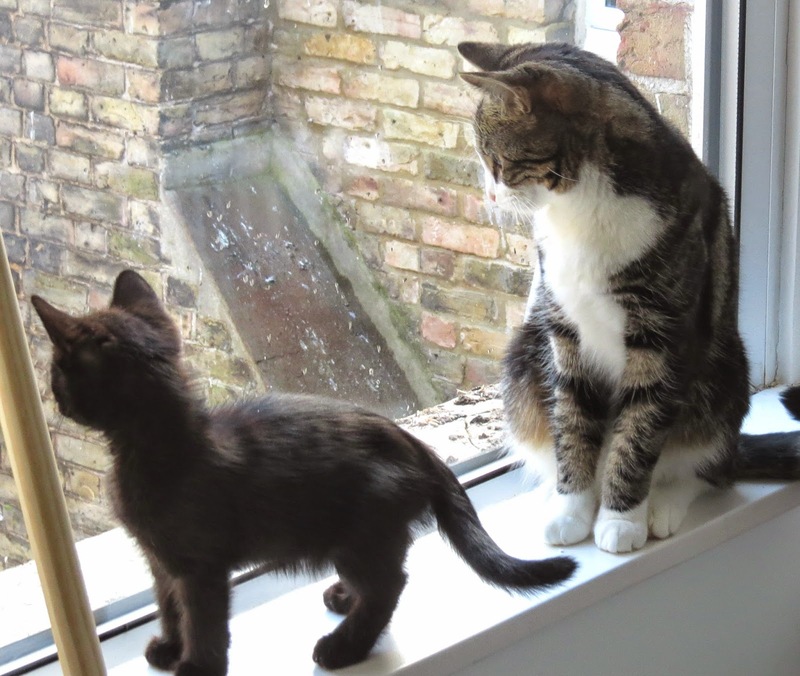 Living with Inspector Bucket and The Kitten at the same time has made me appreciate how very different individual cats are. Bucket came in to the RSPCA's care as a stray, but despite his mean street background, he's quite an anxious, highly strung moggie, much happier indoors (he seems genuinely relieved to be kept inside now! ), he craves human company and is generally very particular and almost neurotic in some of his quirks. He only eats dried cat food - even chicken, or tuna, or fresh fish, appals him, and the only "prey" he ever brought home were frogs, which he wouldn't harm, but would delicately carry back and release in to the house. The Kitten on the other hand is a one-feline-food-processing-Machine - I give him fresh meat as well as dried cat food which he demolishes, often stripping bones clean like a tiny panther, and this morning he killed and consumed his first spider. He steals food from plates and worktops, he tries to raid the bin. He's bolshy, confident, and full of "proper" cat attitude. He chases his tail, sleeps on a special cat blanket (and not the human's beds) and has a deafening purr. He and Bucket could not be more opposite, I'm quite certain that if he were to go outside he would kill, everything. I think I summed up the difference between my two cats perfectly recently when I said that were I to abandon them both one day, The Kitten would be fine, he would feed himself out of bins until he were big enough to hunt, by which time he'd get fat on the Monster Rats of Margate, and would live out his days in obesity and arrogance. Bucket on the other hand would sit and wait for me to come back for a few hours, before laying down and admitting defeat. The Kitten would probably bring him bin scraps back and try to convince him to find some will to live, but unless anyone had thrown away an unopened box of Whisker's biscuits, he'd be unable to survive. 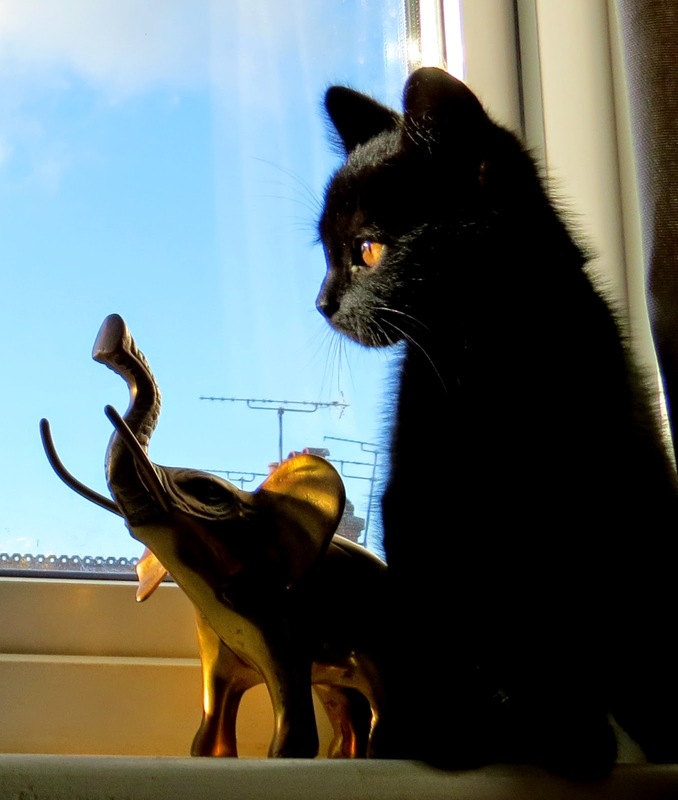 Did you know that 80% of the cats taken in by the RSPCA are black? 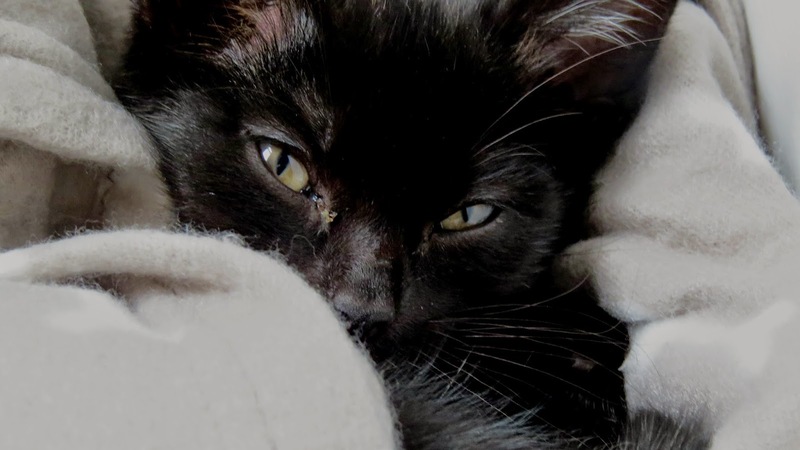 This has lead to an inaccurate assumption that there are simply more black cats about than other colours, but this is untrue, it's just a simple fact that black cats are less likely to be wanted as family pets than any other colour - which is why you'll see so many looking for new homes via shelters. 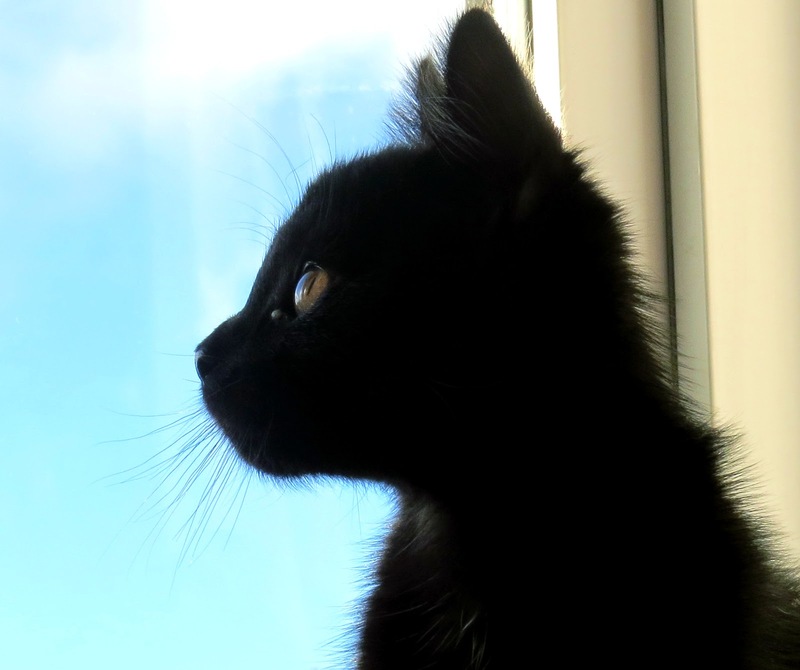 Amongst those black cats actively given up by previous owners, the RSPCA has seen an alarming rise in people choosing not to keep their black cats because they're difficult to photograph (yes really), though they're typically unpopular because of associations with The Occult, witchcraft and bad luck. All of this is nonsense of course, a black cat is simply a cat - with black fur, and he or she is no less suitable for your family than a cat of any other colour. The Kitten is, indeed, very difficult to photograph, but his coat and yellow/green eyes are beautiful. He is silly, soft and affectionate, he loves to be cuddled, and he has no concept of the colour of his own fur. In shelters a black cat takes a tragic average of 11 months to find a new home, whilst a ginger cat takes an average of only 5 days to be offered a second chance at life. 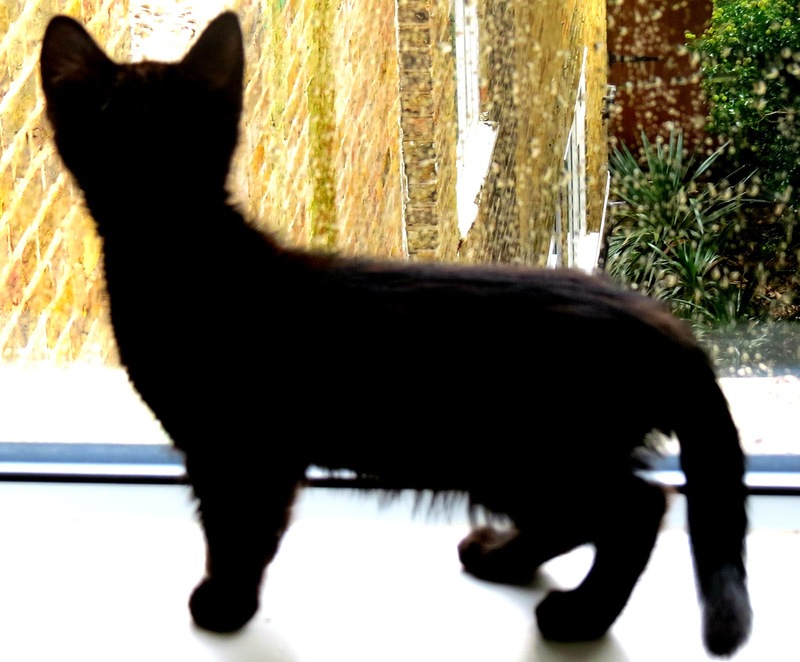 If you're thinking about rescuing a cat or kitten soon - please please, I implore you - don't overlook the black 'uns. Be a part of the Black Cat Movement that see's black cats whisked from shelters in to happy loving homes, where they, like all cats, belong. The Kitten, along with Inspector Bucket, and Boyfriend's black cat, Elphaba, feature pretty heavily over on my Instagram, if you're fond of cat pictures, you can follow us all here. He's a beautiful little thing I have to say. It's a shame about the black cat stereotype, I was aware of it and it has always made me quite sad. I'd most certainly have a black cat next time around. My cat Oliver is grey and white and was also a rescue cat although in slightly different circumstances to Inspector Bucket. I'm such a cat lady and would love to have another cat but sadly we have tried it with Oliver and he just will not accept another one, we were scared he was going to run away from home (oh the drama).